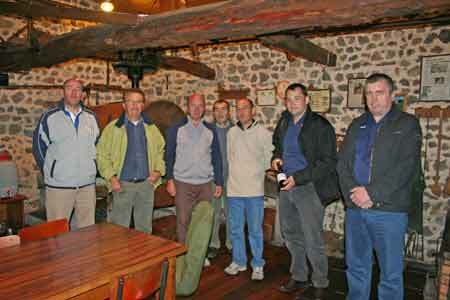 Cappoquin Twinning Group celebrated Bastille Day, July 14th 2010, with a “Santé” in the Jardin Chanat la Mouteyre. 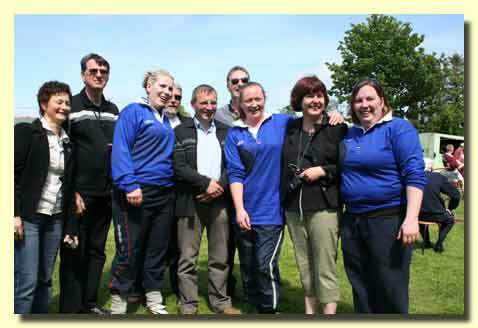 L-R: Evelyn Gallagher, John McGrath, Aine Ní Fhiannusa, Stephen Kennifick, Michael Russell, Bridget Morrissey, Mary Fives, Peter O’Connor, Joan Mason, Maire Kearney, Esther Barron, Keith Dransfield, Patricia Conroy and Richard Gallagher. We were very happy to have with us, Maire Kearney, the instigator of this Twinning Group which has seen many exchanges in both directions since the first group of Chanatois arrived in Cappoquin in October 1996. The group is always happy to hear from anyone wishing to take a trip over to experience the warm welcome which awaits “Cappoquinois” amongst the families in Chanat. 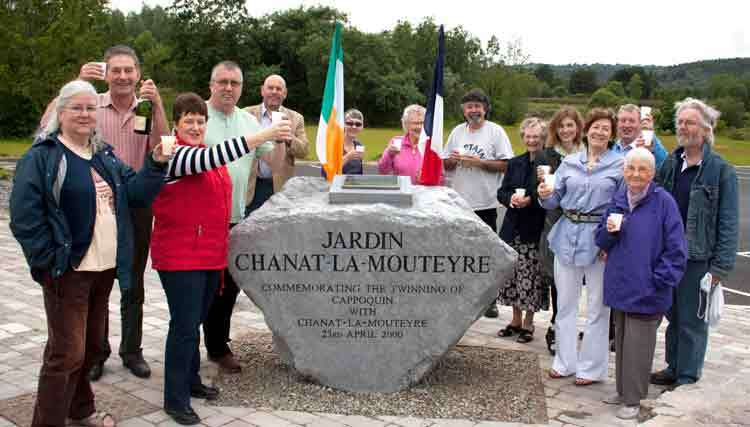 Cappoquin Twinning Group thank the very many people who made our visitors from Chanat la Mouteyre so welcome over the weekend of the sixth Cappoquin Cornerstone Carnival. 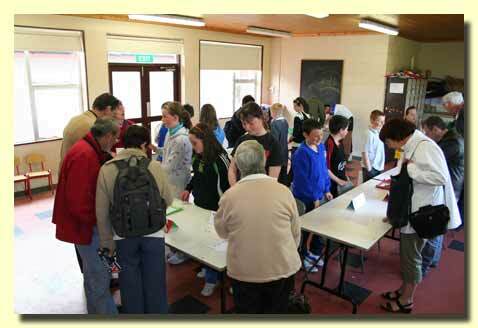 Particularly we thank the Host Families who looked after them, indeed making them part of the family during their stay. These exchanges are at the heart of the European Twinning movement which allows a much greater appreciation of each other’s culture than can be gained from normal tourism. 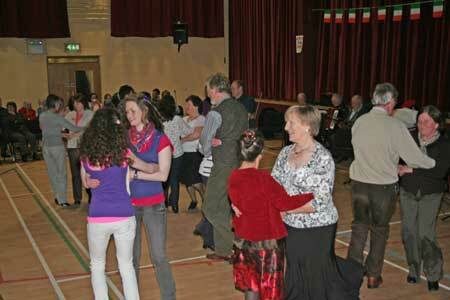 We thank also our sponsors including Waterford County Council, Deise Link, Helen and Paddy Kealy who led the Music and Dancing at our farewell evening in The Central Bar, Mary McGrath of Melleray who donated hampers for our raffle and the other private individuals who helped with the costs of the weekend visit. Congratulations to the Cornerstone Carnival Committee who organised the festival which filled the town with such excitement and enjoyment, it was certainly appreciated by the French Visitors and Jean Maurice, their Mayor, was amazed and envious to see the variety of activities and the community spirit which was so obvious throughout the weekend. Almost all the events were offered free of charge and we thank the organisers for their huge effort and hard work which produced, surely, the best Carnival so far. 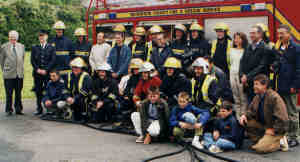 Apart from the Carnival events such as the Fire Service demonstration where they met old friends, the fireworks, the exhibitions, the Recession Olympics and the fun at the GAA field on Sunday afternoon our visitors enjoyed a morning stroll along the Glenshelane Forest Trail and trip along the beautiful and historic Blackwater all the way from Youghal to the Boat House in Cappoquin. On Saturday morning at the packed Market on The Square our visitors served up the Auvergne specialities of St. Nectaire and Bleu d’Auvergne cheeses, jambon, saucisse and Cote d’Auvergne wine which complemented the variety of local produce on offer. During the market we held a short ceremony to celebrate the tenth anniversary of the signing in Cappoquin of the Twinning Agreement and we were delighted to have with us our local Councillor, Norah Flynn, fulfilling one of her last engagements as County Mayor, and Seán Kelly, MEP. 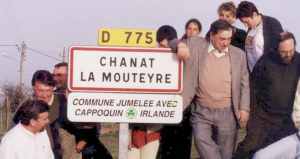 In his speech Jean Maurice Heinrich, Mayor of Chanat la Mouteyre, said how proud he was to follow in the footsteps of Hubert Hebrard who was Mayor of Chanat in 1996 when a delegation from his community came to Cappoquin at the invitation of Máire Kearney. 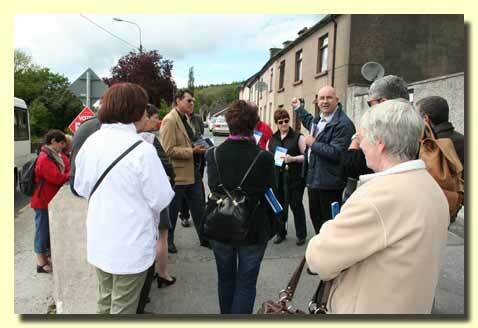 That, he said, was the beginning of the courtship and, although it was difficult to see which community was the suitor, the “engagement” was announced after a group from Cappoquin, including Councillor Norah Flynn, had visited Chanat at Easter 1997. After further exchanges the Twinning Agreement was first signed in Chanat in 1999 by Mayor Hubert Hebrard and Councillor Ollie Wilkinson. This “marriage” required a second ceremony which took place in Cappoquin in April, 2000 and so the couple now celebrate their Tin Anniversary! The union is unusual, said Jean Maurice, because, even after the marriage, the “couple” live apart for most of the time but that only means, of course, that reunions such as this weekend are all the more passionate and enjoyable. 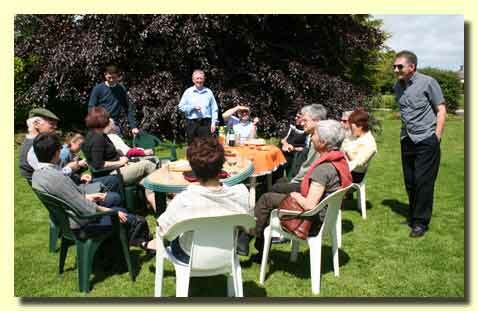 The Chanatois are determined to continue the project not least because the exchanges allow the communities to enjoy time together and in today’s stressful world we need to take every opportunity to relax with friends. He thanked the people of Cappoquin for their warm welcome and hospitality, he declared that both Twinning Groups should be very proud of the results of their hard work over the last ten years and hoped sincerely that we would continue this adventure together. 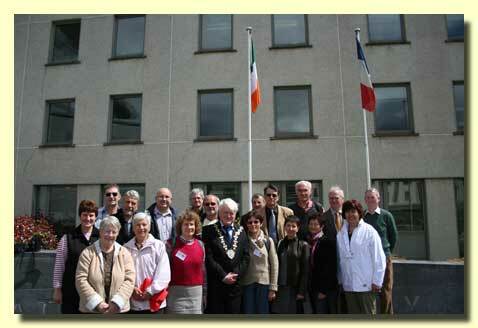 Mayor Norah Flynn replied that she had enjoyed at first hand the hospitality of the Chanatois and so had great memories of her time in the Auvergne. She encouraged others to join the movement which, like the Cornerstone Carnival, puts great emphasis on unity of community effort. She presented the Mayor with a commemorative vase of Comeragh Crystal, inscribed with a harp, a symbol of Ireland which is also to be found at the entrance to the village of Chanat. 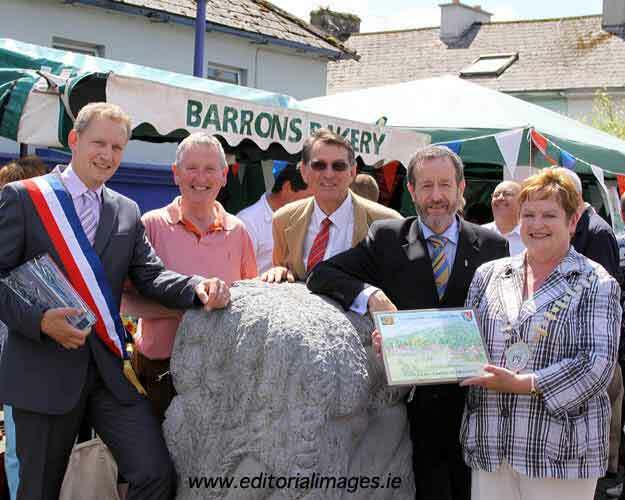 In return Mayor Jean Maurice presented to Cappoquin a plaque of Auvergne volcanic stone, enamelled with a picture of Chanat to be incorporated into the limestone block of Jardin Chanat La Mouteyre when that is reinstalled after the works in town are finished. 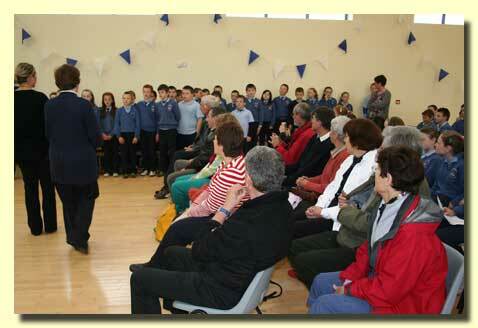 Seán Kelly spoke of the Twinning project as part of the unifying European movement. The peace enjoyed in Europe for so long is proof of what is possible when local communities work together on such projects and who then reach out internationally to like-minded groups. He congratulated Cappoquin on the success of their Carnival he had “really enjoyed the event and there was a great buzz around the place”. He noted that such success does not come without the hard work done by the organising committees and he wished both the Carnival and Twinning groups well for the future. 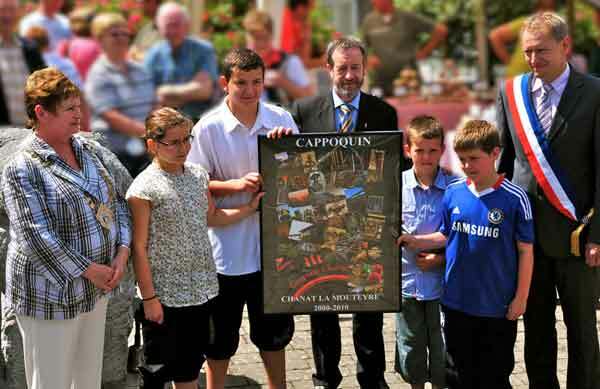 The final part of the ceremony was performed by Noel Cliffe and Cian Murphy of Cappoquin who presented to Hugo and Romane Pichon of Chanat la Mouteyre, a collage of local photos composed by Tom Kelleher. 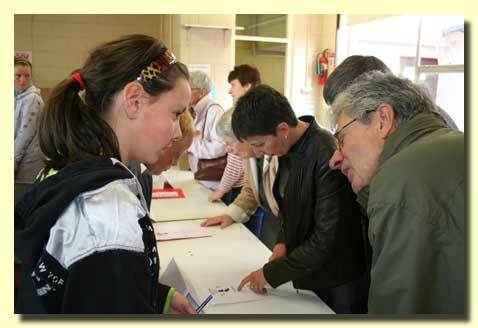 An exchange between young people which points the way to the future. 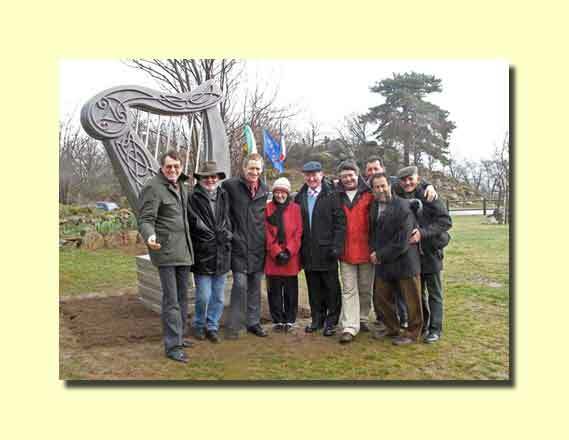 On Saturday 27th March last Councillors from the Puy de Dome region and the Comité de Jumelage de Chanat La Mouteyre joined the local villagers led by the Mayor and visitors from Cappoquin to unveil a sculpture marking the Tenth Anniversary of the twinning link between our towns. 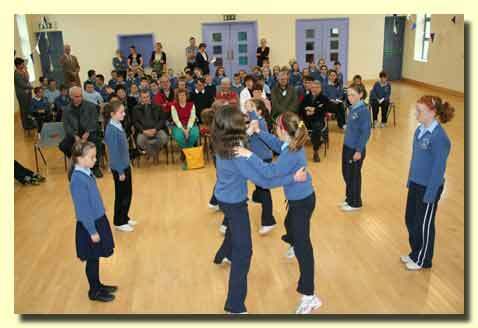 The wind and rain did not subdue the warmth of the celebrations around the inauguration which included song and dance entertainment provided by the children from the local schools who also sent over replies for the students in Bunscoil Gleannsibheáin who had earlier written letters to them. The Unveiling Ceremony: Included in the picture are Mr. Louis Giscard D’Estang, Councillor of the Puy De Dome Region and Mr. Jean Maurice Heinrich, Mayor of Chanat La Mouteyre. 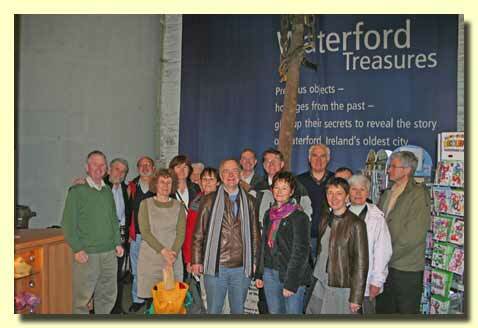 After the Unveiling: Included in the picture are some of the visitors from Cappoquin and the Chanatois who helped to create the sculture. 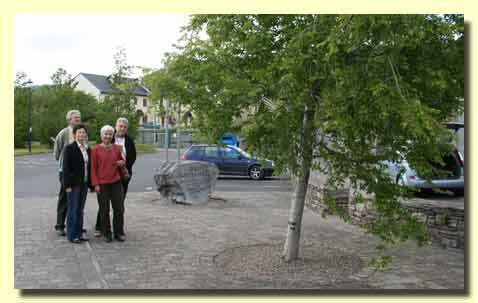 The sculpture, standing at the entrance to the village, is a symbol of Ireland, entirely designed and created by the Chanatois themselves. 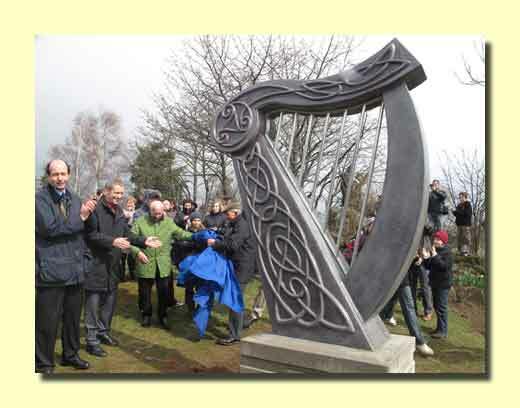 They intend the Celtic Harp to represent the harmony in the strong links and friendship between our communities along with their desire to continue the exchanges despite the distance. 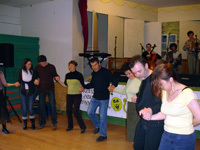 In the evening Chanatois of all ages came together again in the local Chateau to enjoy a concert and dance with a mixture of Auvergne and Irish traditional music and the lively crowd were entertained until the early hours of Sunday morning. 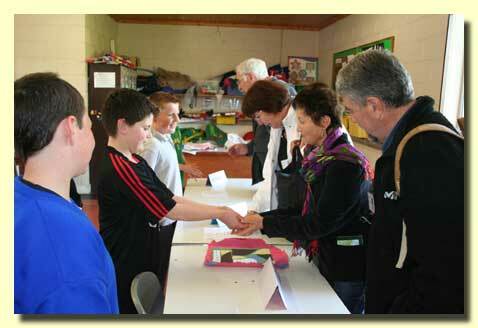 The Comité de Jumelage confirmed that a group from Chanat will be coming to Cappoquin for the last weekend in June to enjoy the Cappoquin Cornerstone Carnival during which a ceremony will take place to mark the Tenth Anniversary of the signing of the Twinning Agreement in Cappoquin in April 2000. Hopefully they can repeat their display of Auvergne delicacies which was much appreciated when they set up their stall at the Local Producers’ Market at the Carnival two years ago. 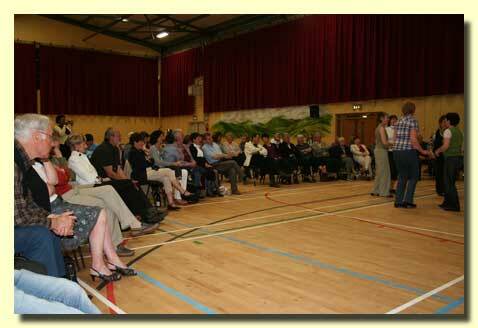 Merci Beaucoup to all who helped organise and take part in this event. 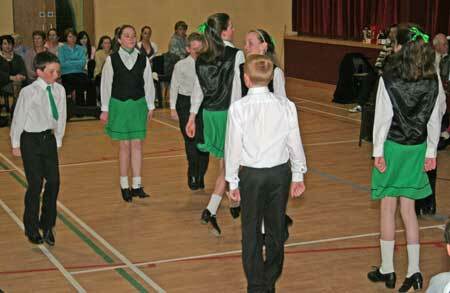 there was an astounding array of talent on show; very many thanks to all. 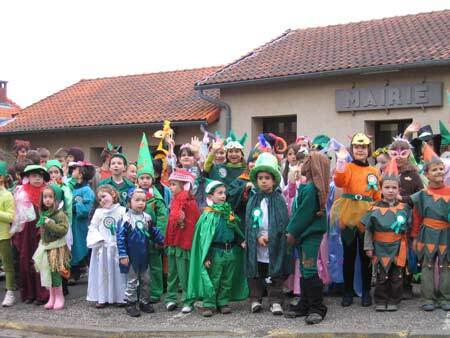 Children from Cappoquin and Modeligo sent Greetings for St. Patrick's Day to the pupils of the schools in Cappoquin's twin town, Chanat la Mouteyre. The French students were delighted to receive a Card each along with St. Patrick's Day badges kindly donated by Tom Kelleher of Supervalu, Cappoquin. 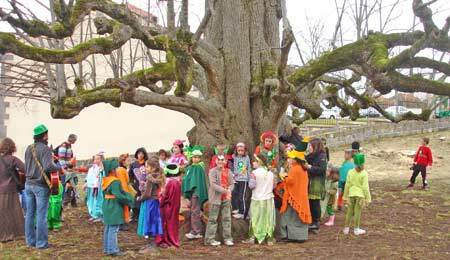 On Saturday 15th March the children, along with their parents and many locals, were led by the traditional Auvergne musicians, Tournelune, on a "Balade" through the village with many stops for stories and songs, some of which were performed in English by the pupils. 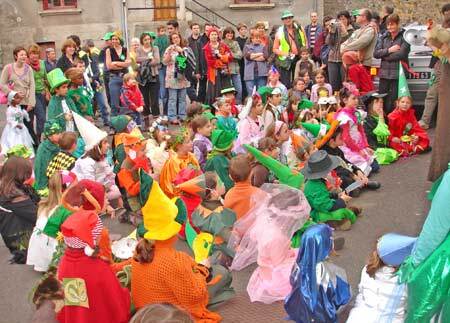 The Chanatois had made a tremendous effort to produce very varied and colourful costumes so that the narrow streets were filled with waves of green and orange.The weather was very kind and reached an unseasonal 22 centigrade in the afternoon, a great contrast with the temperatures we have to endure presently in Ireland. 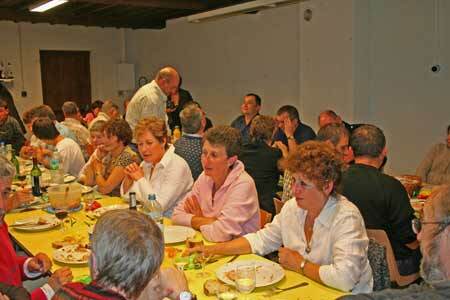 The happy throng sang and danced from the Salle des Fetes at the top of the village, past the local school with a stop at the Mairie for a group photo and on to the Poste des Pompiers and the Eglise where we were entertained with more stories and songs. The parade finished at the Chateau des Milles Sources where the children had a party with food and drink provided by the Comité de Jumelage. 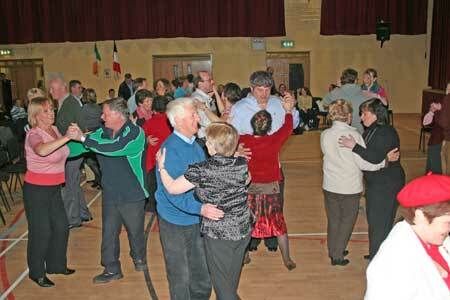 The music and dancing continued almost until midnight in the chateau which had been transformed into a little piece of Ireland. 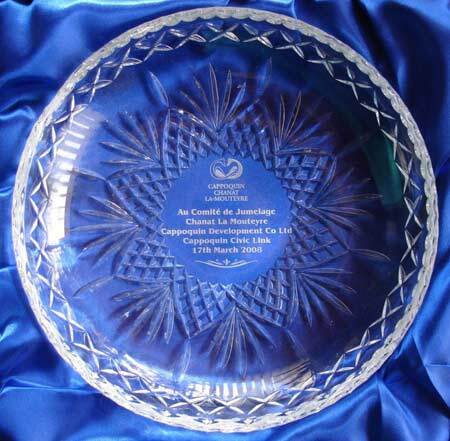 Cappoquin Civic Link presented the President of Chanat's Twinning Committee with shamrock on a specially commissioned commemorative plate of Ring Crystal. 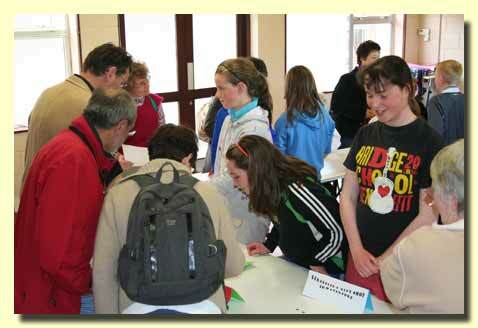 In April, Cappoquin said Cead Mille Failte to Eric Pichon and his family from Chanat as they enjoyed a week discovering the local attractions and hopefully more visitors will follow throughout the summer. Plans are also being made by a group from Chanat who are studying English to come over later in the year, possibly after October. 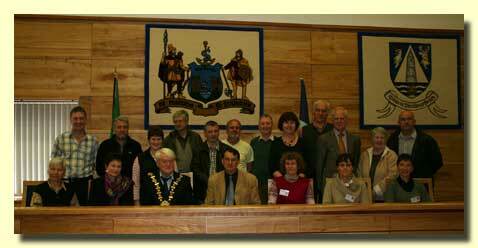 For next year Civic link would like to encourage a group from Cappoquin to travel to Chanat to join in the St. Patrick's Day festivities in our twin town. 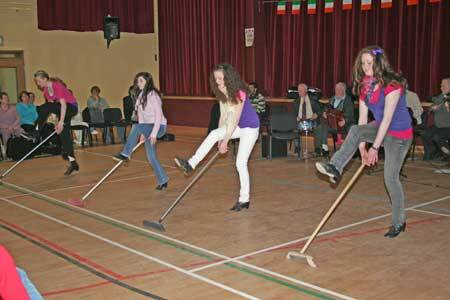 The Chanatois make great efforts to celebrate our National Feast Day and would be delighted to be able to include again Irish musicians and dancers as they did last year. 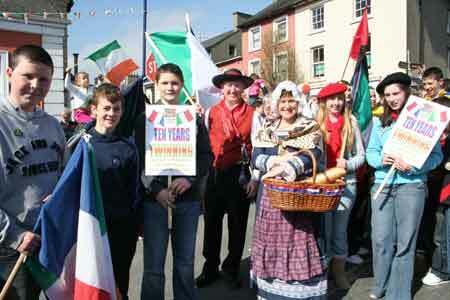 Cappoquin does not have a parade locally but no-one could enjoy better "Craic" than was found in Chanat on St Patrick's Weekend this year. 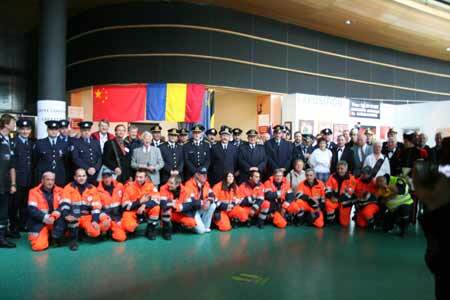 The previous exchange between our communities was in September 2007 when nine people travelled to Chanat where four local Firemen attended the French National Firemen's Congress in Clermont. 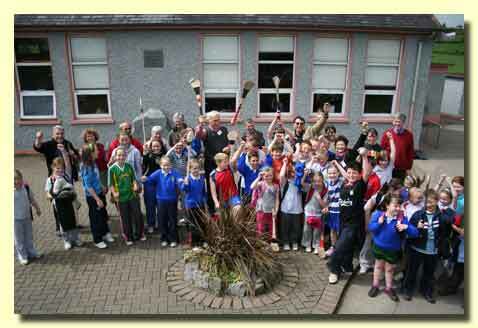 All enjoyed the wonderful hospitality of the Chanatois and planning for a visit of our friends to Cappoquin in 2008 was begun. 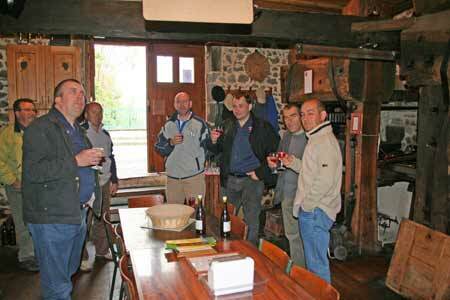 The following account of a previous exchange was published in the "Info Express" newsletter of Chanat. 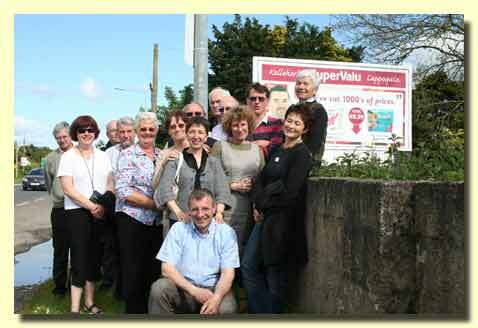 Quinze Chanatois et voisins de la communauté de communes "Volvic, Sources et Volcans" se sont rendus en Irlande à l'invitation de nos amis de Cappoquin. 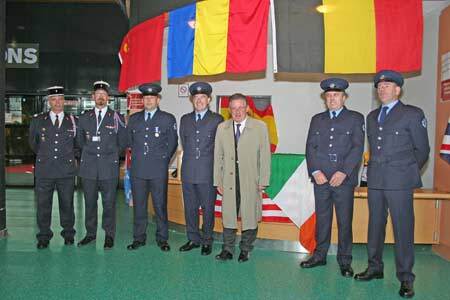 Après un voyage agréable et sympathatique,·malgré les grèves des transports, ils ont été acceuillis à l'aéroport de Cork par une grande banderole de bienvenue. Reçus dans les familles irlandaises, ils ont ainsi partagé leur vie quotidienne durant trois jours, s'immergeant dans la culture irlandaise, ses sites naturels, ses bourgs et ses curiosités. Au-delà du dépaysement, de la différence linguistique, les chanatois ont été unanimement impressionnés par la sincérité et la chaleur de l'accueil amical et familial. Malgré la courte durée du sejour, chacun est retourné avec une impression de plénitude et de bonheur et c'est la gorge serrée qu'ils se sont séparés de leurs hôtes. 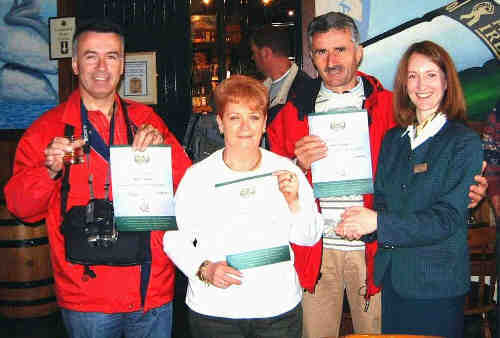 Ce voyage, tout en permettant aux participants de mieux se connaître, leur a donné une occasion unique de visiter l'Irlande de l'intérieur d'appréhender et comparer les modes de vie, les préoccupations, les atouts et les faiblesses de nos pays respectifs. Quatre jours qui laisseront au coeur des participants de moments très forts, la certitude d'avoir trouvé au-delà des océans, un témoignage d'amitié. A tous ceux qui n'ont pas encore eu l'occasion de découvrir le "charme irlandais", il ne leur reste plus qu'à manifester leur souhait auprès du Comité de Jumelage et pour prendre patience de se verser un verre de Guinness en écoutant 'Danny Boy' par les Dubliners. 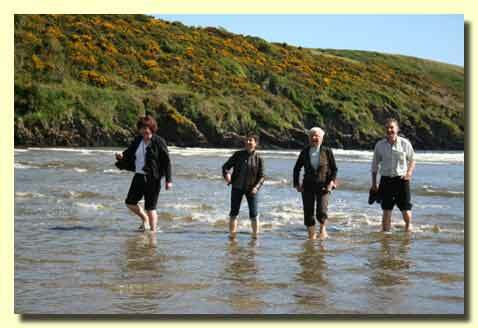 "To the house of a friend, the road is never long".